Taking a trip by water always offers a different perspective of the surrounding area and a steamship cruise on Loch Katrine makes for a very relaxing outing. 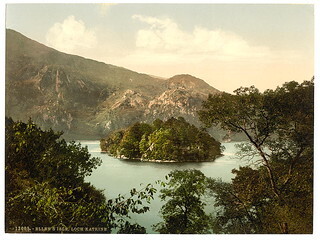 There are several small islands in Loch Katrine: Ellen’s Isle, a cobbled beach, which in Gaelic is An t-Eilean Molach, or ‘the shingly isle’, the Black Isle, and Factor’s Island, ‘Eilean a’ Bháillidh’. Queen Victoria famously sailed up the loch in 1869 and had a holiday house built here. You can follow in her footsteps today on the historic steamship, Sir Walter Scott. The steamship was aptly named after the inspired literary figure, a Scottish historical novelist, whose famed poem Lady of the Lake was written in 1810 after Scott had visited Loch Katrine. The steamship has been cruising the waters of Loch Katrine and captivating visitors for almost a century. Sailings depart from Trossachs Pier at the east end of the dock, and runs a ferry service 8 miles west along the loch to Stronachlacher in the mornings and afternoons of spring and summer, travelling at the gentle pace of the steam engine. Perhaps you’d like to include a sailing on Loch Katrine in your itinerary?